Temple clothes can be confusing to choose and purchase, especially if you are preparing to go to the temple for the first time. Our guide helps those who have never been to the temple, those who are endowed but have not yet purchased clothes, and long-time temple goers who are ready for something new. To get the inside scoop, I sat down with Kimberly Rash, a long-time clothing designer who specializes in temple clothes at her business, The Perfect White Dress. Do I Need Temple Clothes? If you are going to the temple as a youth to perform baptisms for the dead, you’ll want to bring an extra pair of underwear—you’ll be getting wet—but you do not need to bring any special clothes. If you are going to witness a live sealing, you should wear Sunday best clothes but do not need special temple clothes. Temple clothes are for those going to the temple for endowments or to participate in sealings. Kimberly adds that even those who go to a temple with clothing services will often want to purchase their own temple clothes to reduce costs over the long-term, in order to find something that fits well, or in case they travel near a temple without clothing services. What Temple Clothes Do I Need? There are three kinds of temple clothes you’ll need for your visit to the temple. You will need garments for your first visit to the temple. But unlike other temple clothes, garments are intended to be worn every day. Even if you don’t purchase other temple clothes before your first visit, ensure that you have purchased a sufficient number garments for every day wear. Ceremonial clothes are used during endowments and sealings. These clothes are symbolic and sacred and should never be used outside of the temple. Those who attend the temple wear all white clothing. There is nothing inherently sacred about these clothes. But Kimberly says that most people prefer to have a devoted set of white clothes to wear when they attend the temple. How Do I Purchase Temple Clothes? Garments and ceremonial clothes should be purchased directly from the Church. You can either purchase them directly from the Church’s website, or you can find a Church distribution center near where you live. In order to purchase these items, you need a temple recommend. Your stake must also enter your temple recommend information into the Church’s worldwide system. If you have recently received your temple recommend but you are not yet allowed access, let your bishop or stake clerk know. If scheduling considerations make waiting for the recommend impractical, another member of the Church who has already been through the temple may use their account to purchase garments and ceremonial clothes on your behalf. White clothing, on the other hand, can be purchased from anywhere, including from the Church. Some designers, like Kimberly, have devoted an entire business to cater specifically to needs of temple-goers. Others choose to buy white clothing off the rack or sew their own. How Do I Choose Garments? When purchasing garments you will choose both a cut and fabric for your garment. If you live close enough to visit a Deseret Book or Distribution Center, you should strongly consider going to purchase the garment. In spring of 2016, the Church began allowing garments to be tried on prior to purchase for endowed members. Those who are purchasing garments for the first time can view them out of the package, and feel various fabric samples. If you live far enough away that visiting a store in person is not feasible, make a list of the fabrics you may consider and visit a local fabric store so that you can sample the various styles before purchasing. Also, be sure to look at the sizing charts online for each garment piece. Open garment packages can now also be returned. If you must order online, don’t be shy about ordering a few potential styles, and returning those you don’t like. There are also many other garment options that can meet your individual needs. Maternity and nursing garments are available. Special military garments are produced. Members who require long-term bed care can request special garments from their bishop. And cold weather thermal garments can also be purchased. If you don’t find garments that meet your circumstances, don’t be shy about calling the Church’s Distribution Center Customer Support. There may be options that you have not been able to find on your own, and if there are not they can create a special order for you. How do I Choose Ceremonial Temple Clothes? Ceremonial clothing has much fewer options. You will need to find your size for the temple robe—a sizing chart is available on each item of clothing. For each piece of the ceremonial clothing, there are usually a small number of options. In general, those who are going to the temple for the first time should choose the option they would consider easiest to use. 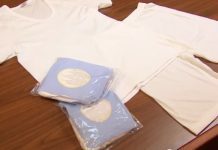 All the ceremonial clothes are then sold in a single packet that can be purchased online or in an LDS Distribution Center location. 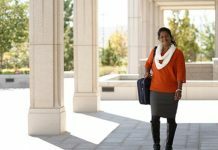 Those who will be attending the temple for the first time, or who are new temple workers, may be able to receive a discount for ceremonial clothing. Call or visit a distribution center for details. What White Temple Clothes Will I Need? Clothing requirements for the temple are different for men and women. Modesty-The baseline standard for temple clothes is that they cover the garments. Necklines on temple clothes must cover the garment. Garments shouldn’t be pinned or altered to meet this standard. Sleeves-For shirts, blouses, and dresses, the sleeve must reach the wrist. Length-While most temple skirts, and dresses are floor length, this is not required. Temple clothes must extend to the ankle, so tea length is appropriate. Color-All temple clothes must be white. Any adornments must also be white. No off-white colors such as ivory or eggshell are appropriate. How Do I Choose My Temple Clothes? Kimberly told me that the most important part of a temple dress is the woman who wears it. But often, she explained, when we are wearing clothes that we are uncomfortable in or which are not flattering, we spend our time at the temple thinking about our clothes. Your goal in purchasing temple clothes should be to choose something that you don’t have to think about, so that you can focus on the sacred ordinances taking place. Kimberly explained that for most temple goers the number one consideration in choosing temple clothes should be comfort. Kimberly told me a story about a woman who had been wearing her temple dress for thirty-five years. Every time she went to the temple she had to tug and pull and readjust it during her time there. She finally decided to get something that fit. Rather than put up with distracting and ill-fitting clothes for half a lifetime, take the time to find a dress that fits well the first time. Boutique sellers like The Perfect White Dress can often tailor temple clothes to an exact fit. Kimberly also recommends that tea-length dresses may be a good option for many, since quite a few temples have stairs and full-length dresses can be difficult to navigate in. Just as temple clothes can be distracting because they do not fit your body well, they can also distract because their appearance does not fit who you are. If you become self-conscious because you feel like you’re walking through the temple in a potato sack, you may struggle to focus on more important things, even if the people around you aren’t focused on your appearance. Many of Kimberly’s customers say they are looking for temple clothes that make them feel as though they are not out of place in the beautiful temple. But ultimately, what you find beautiful is up to you. If you can’t find temple clothes you like from the Church’s selection, consider other sellers. Also, think outside of the box. Dresses have been de facto for many years, but white skirts and blouses are also an option. Kimberly even reports seeing a white sari-style outfit worn. Kimberly reminded me that no matter what you choose, most people will get one, maybe two, sets of temple clothes in a thirty-year span, so choose something you will be happy with. 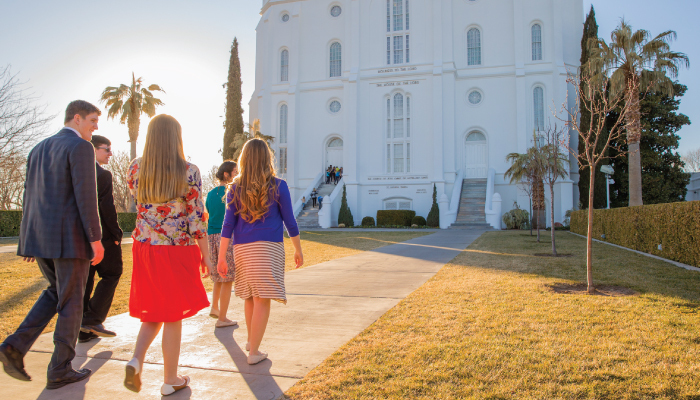 There are several convenience factors to consider when purchasing temple clothes. First off, you will want to travel with your temple clothes, but will not want to have to carry a garment bag to the temple. Many people have smaller bags devoted to temple clothes, so you will want a fabric that can be rolled up and stored without having to be ironed. Something like crepe, cotton-spandex blends, or polyester works best. While skirt and blouse options are now available and preferred by some, Kimberly suggests that nothing is as convenient and easy to use as a one-piece for being able to change quickly and store easily. You also want to consider long-term convenience. Many first-time temple goers are attending to get married. Shortly after they are having a child and their temple dress no longer fits. Consider a style with a waistband ribbon that can be adjusted. Temple clothes will cost something, and for many young people, the price of temple clothes can be prohibitive. The Church has worked to bring down the price of their options, but their prices are static. Kimberly told me that while most outside sellers have higher base prices, they will also offer options on sale or have special promotions. For example, her company will offer special discounts to its followers on Facebook and Instagram. If you are on a tight budget, paying close attention can help you find a price that will work for you. What questions do you have about choosing temple clothes? What advice do you have for others? Let us know in the comments.